Small Sources 29. 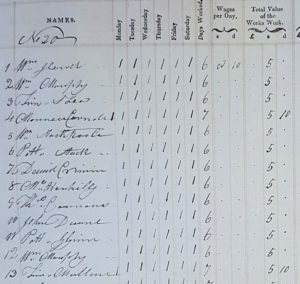 This list shows Labourers on the Doneraile Estate in Cork in 1839/40. It includes 21 men, 2 boys and 1 woman. 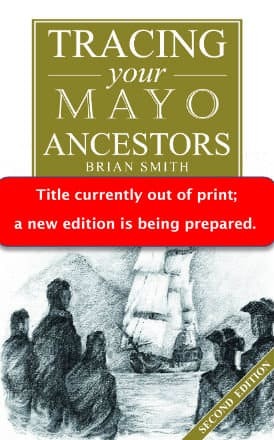 The names were extracted from a document among the Doneraile Papers in the National Library of Ireland entitled “Workmen’s accounts book, 18 May 1839 -25 Apr. 1840” (Ms. 19,726) which shows the dates worked and payments made to each worker. Our female readers may be interested to know that the payment for the solitary female worker, Johanna Glynn, was 6 pence per day, whereas the men were paid 10 pence and even the boys received 6.5 pence per day. These were the permanent workers on the estate. This can be determined by the fact that most also appear in an 1847 Valuation of Doneraile town as residents of Mallow lane. 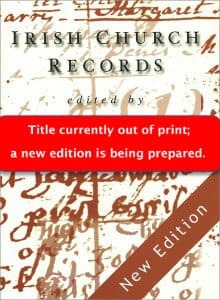 This document, a House Book compiled during the Valuation of Doneraile Town can be accessed on the Find My Past website. The page of the Valuation contains a note ‘This is the South side of Mallow Lane, Lord Doneraile’s workers’ and it is also noted that the workers paid no rent. The estate had leases on many properties in Doneraile town and this line of cottages was apparently allocated to the workers. The date of this valuation is also significant as it shows that all of these workers survived the Great Famine which lasted from 1845-1847. The valuation of Doneraile was also useful in interpreting names in the accounts record. The handwriting in this record is difficult to decipher in many places and the names are listed as apparently spelled, with notes on possible other interpretations included. The spelling of several of the names has been clarified by reference to the Valuation document. For instance Herhilly is actually Herlehy. Note that the author makes a very ornate capital ‘M’ which makes ‘Mullane’ appear to be ‘O’Mullane’ etc. The abbreviations are included as used e.g. Ml. = Michael, Wm. = William, Ths. = Thomas etc . The Griffith Valuation, conducted in 1851 approximately, includes 8 of the same individuals and several other households of the same names. The Doneraile estate was owned by the St. Leger family. An account of their association with the town can be found here. The grounds and garden of the estate are now a public park and €1.6m has very recently been provided by government to renovate the house, Doneraile Court – see here. Ancestor Network will offer 1 free hour of research by a professional researcher to conduct further research on these individuals or others in these estate papers. Click here and quote ‘Cork SS29’ in the subject line. All of these are listed in the workmen’s accounts. On the right is indicated the other records in which they were found at the Mallow Lane address in Doneraile. 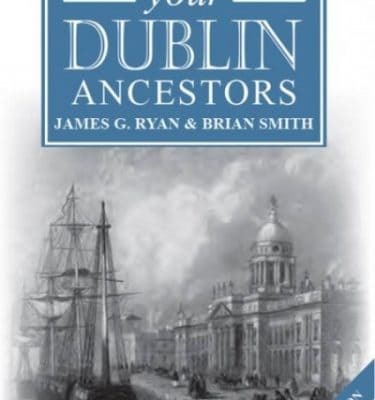 ‘Tracing your Cork Ancestors’ a comprehensive guide to researching families in the city and county. Published by Flyleaf Press and available from here.